All-Ways Elevator offers a wide variety of commercial passenger elevator packages to suit your specific project requirements. Fully ADA and safety code compliant. Capacities from 2000 pounds and up. Inground and Holeless designs to fit a variety of applications. Cab interior designs to fulfill your vision and meet your needs for aesthetics and functionality ranging from enamel to bronze, laminates, glass to stone and all species of hardwoods. Door arrangements include Front, Front and Rear and Front and Side to accommodate your traffic flow. 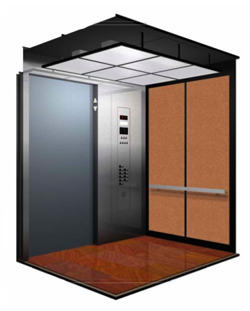 LULA Elevators for Limited Use Limited Application: Capacity at 1400 pounds allows for a smaller footprint in churches, restaurants, libraries and small offices etc., to provide handicap accessibility. Hoistway entrances in a wide variety of baked enamels and architectural metals to add visual appeal to your lobby or hallways. Signal fixtures provided to create a distinct look and ensure dependable operation. With our focus on design, performance, reliability and economical operation, you’ll find our installations exceed your expectations. Choose All-Ways Elevator for all your commercial elevator installation projects.